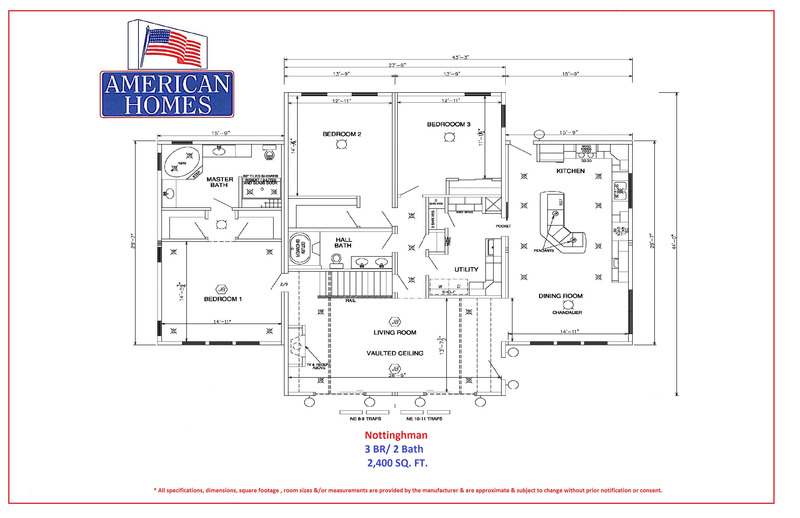 3 Bedroom / 2 Bath / 2,400 sq. ft.
Bring the outside in with this eye-catching 3 bedroom 2 bath chalet. Featuring large windows all around and a 2 story living room, this home is perfect for watching the seasons change without having to leave the comfort of your fireside lounging area. The Nottingham has a bonus 2nd floor loft area you design yourself…perhaps a home theater, rec room or additional bedrooms for guests. The spectacular interior is perfect for entertaining family and friends. A custom kitchen features a double oven, an island, an over-sized breakfast bar, a wet bar and an open floor plan connecting the dining area. A cheery master retreat complete with a soaking tub, a ceramic shower with seating, his & her closets and sinks allow you to relax after delighting your guests. The Nottingham’s unique chalet style and its many amenities make this home a stand out on our lot…or yours!